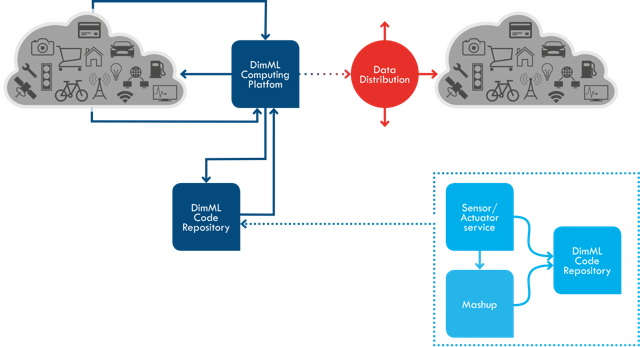 DimML stands for computing that is all about data coming in and being processed at the moment that it’s coming in. You can use the DimML technology to build all data driven business solutions you can imagine. Even the most demanding. Get online data collection up and running in just 5 minutes, creating faster and better insights. Be creative and imagine how easy Big Data streams can be of extreme value for your or your clients’ business. Gain insights in the customer journey on the fly and connect the smartest data to any business process quickly, easily and flexibly. There is no storage of data, it directly process specific types of data that can be processed in motion. You start with a Single Line of Code (SLoC) per type of device. The coupling of devices with the DimML platform is done through a DimML file, written in the DimML language. Each report is accompanied by a code request. After receiving a request from the device, DimML contacts the code repository for DimML code – containing the logic that has to be executed – specific for this system. The rest of the code remains in the code repository. The DimML language allows for a very flexible and structured way to maintain different types of code (not different code, but different types of it) within its code base. So, if you want to change the service you use at some point you do not need to go and install a different type of code into the end service. All you need to do, is change the DimML code within. When the next event comes, DimML will automatically distribute this particular code for execution. It only sends the minimum amount of code that you need to collect the data that you are looking for. This shows how DimML offers integration over various natures of data processes.